Planet Hell: Now Playing - "Don't drink the water if it smells funny." Now Playing - "Don't drink the water if it smells funny." Sorry for the lateness of this, I was out at the weekend and stayed over at my friend's on Sunday, so couldn't post this. Still, I don't think that it is quite apocalypse-causing material, but I like to have an order to things and stick to them. So here is what I've been playing this week. "Mass will have an effect," he says. As long as it lifts us out, I figure. Should have specified "within my lifetime." "Gives us time to talk", he says. "How's a dwarf get named Shepard?" "No really, because blah, blah, blah." Axe answers, but I still hear him. Think I'll drop out for some air. Anonymous scratching recovered from a cage hoist... eventually." I had been mucking around with Etrian Odyssey (DS) in the first few floors, watching some videos and following some hints on sites to try and get ahead in this game, which I think I've got down. I've got a trick with the Chop skill on some of my secondary guild members to bring in money whenever I need it, its very slow paced and grindy this game, but enjoyable once you get a feel for the game. I've kinda put it on hold for now. I started up Golden Sun again, going through that and I'll probably come back to EO soonish so I can put more time into it and hopefully the 2nd before the 3rd in the series comes out. 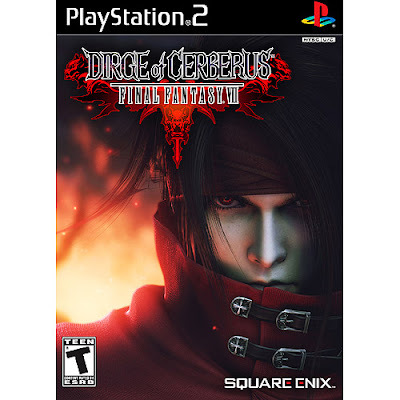 Dirge of Cerberus: Final Fantasy VII (PS2). I had a savegame on this from a couple months back and decided to pick it up again. I got through the last couple missions of the game and finished it off in a day or two. Took me about 11 or so hours I think, and the challenge really dropped off in the last stages of the game, which was odd. You get to go to some really cool areas though, I was thinking it was quite average for the early parts of the game, but when you get to see the scenes in Midgar and past that point in the story, it really started to grow on me, even things that bugged me like the camera, controls, ammo system, money/exp system and targetting reticule became kinda forgotten cos I had started to enjoy it more. So pretty good game, more for FFVII fans than anything else though. It still feels a bit clunky on the gameplay side though. I was aiming to get the max map completion and all the Alucard endings in Castlevania: Symphony of the Night (PS1) and managed that near the start of the week. The only thing I need to do now for 100% is get all the items and beat Richter mode which is unlocked after clearing the game I think. Actually, there are Axe Armour and another code that I forget, but I think they are hidden extras. I might get around to some of that stuff in a few months or somethng, since I really like this game. Definitely among my favourite Castlevania games, if not my top. Really good controls compared to some of the other metroidvanias which take some steps backwards at times, as well as brilliant music and graphics for a quite old PS1 game. The inverse castle felt a bit like lazy game programming, but it was interesting to see some of the areas with a different feel. After a while, it did feel completely different. I've started up a new save on Golden Sun (GBA), after I originally beat the game, but lost my cartridges for both GS and the sequel GS:tLA... T_T Thats what happen when people borrow your games, seriously... 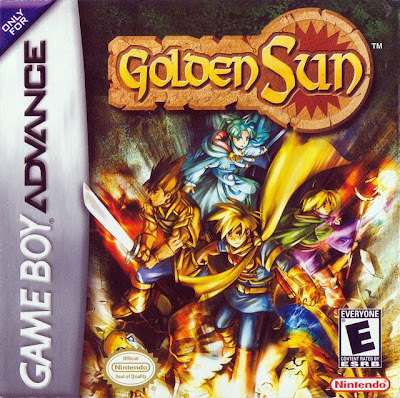 So I wanted to play through Golden Sun and the 2nd, Golden Sun: The Lost Age before Golden Sun DS comes out at some point, possibly getting 100% in this one if its not too hard, as I've played it before many times, I can refer to guides if I need without spoiling stuff too much.